Product prices and availability are accurate as of 2019-04-23 00:59:03 UTC and are subject to change. Any price and availability information displayed on http://www.amazon.com/ at the time of purchase will apply to the purchase of this product. A very popular item! 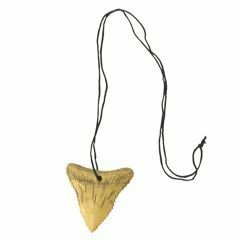 Purchase Shark Tooth Necklaces easily here today. This toy shark tooth necklace is an interest grabber. The rubber shark tooth begins a 28" black cable necklace. Unique! 12 necklaces per order Rubber shark tooth. Ages 3+. Top Quality Children's Item.